Successfully Added 2 Channel 4-Way HDMI Splitter to your Shopping Cart. 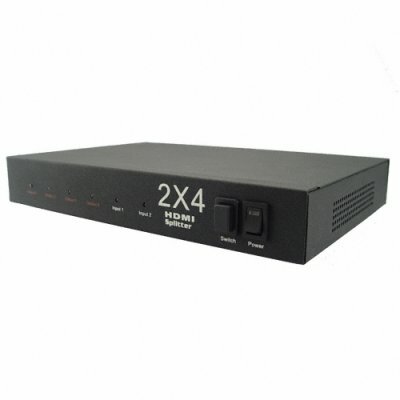 Deluxe model 2x4 channel (two IN, four OUT) HDMI signal amplifier and splitter. This High Definition Multimedia Interface (HDMI) amplifier-splitter allows the signal from either one or two HDMI devices to be sent to 1-4 HD projectors, monitors, or TV's. Great for schools, bars, showrooms, or other business areas where you have multiple screens where you want to send the same Hi-Def signal. Need to show a video demonstration or sporting event on multiple HD screens at the same time? Then here is your answer! Made of a rugged metal black powder casing with frontside controls and LED status lights, plus the ability to be stacked and daisy-chained if needed, this is probably the last HDMI switch box / splitter you'll ever need! Great for schools, bars, showrooms, or other business areas where you have multiple HD screens. If you wish to make comments or reviews about this product, please use the product review box. Please open a support ticket if you have any product questions.